This is a new app from MYOB to help people use their MYOB via their mobile devices. Great for mobile businesses who are on the go. Here are some of the features of the app. We help businesses who use MYOB accounting products to create forms to reflect the professional nature of your business. Instead of being embarrassed of the financial documents you send through to customers, suppliers and employees, we can help make MYOB forms an extension of your branded marketing material. 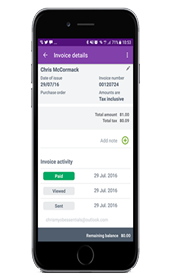 The MYOB Invoice app requires the layout to be correct in your MYOB cloud version. We can help to revamp your MYOB Invoice or other MYOB financial documents for one set rate of $99.00. Limit of 6 forms. Contact us Ph 03 9988 2030 or email info@www.limeresults.tk for a chat about your requirements. We have been helping businesses with MYOB for over 20 years.